Scientists have explained why we are constantly distracted by our social media even when we’re sitting in a mindful conversation with a person in the latest study by Pew Research centre. Do you spend most of your daily hours scrolling through your feed on your smart phone? As humans, we tend to pick up our phones in every situation, be it while you’re eating, sleeping, working or even socialising. You’ll be shocked to know that there’s science behind it. Researchers at the University of Arizona and Wayne State University in the US examined existing research on “technoference,” or the potential interference smartphones and other technologies can have in our face-to-face social interactions. In another study published in the past, 76 college students ranging in age from 18 to 22, had no access to food for three hours and no access to their smartphones for two hours. After that, the students were more tempted to use their smartphones instead of getting a 100-calorie diet! 1. Nearly 50 percent of adults reported they “couldn’t live without” their phones. 2. 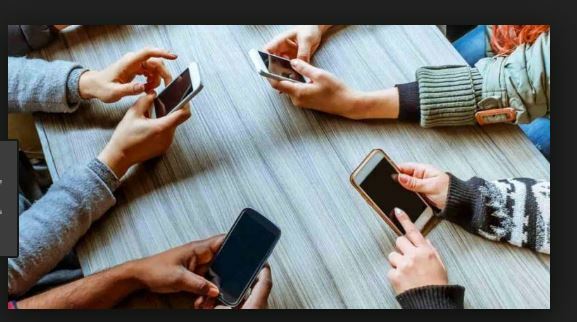 “The draw or pull of a smartphone is connected to very old modules in the brain that were critical to our survival, and central to the ways we connect with others are self-disclosure and responsiveness,” said David Sbarra, a psychology professor at the University of Arizona. 3. In the course of evolutionary history, we have relied on close relationships with small networks of family and friends for survival as individuals and as a species, researchers said. 4. These relationships were based on trust and cooperation, which is built when people disclose personal information about themselves and are responsive to others, they said. 5. Smartphones and the constant access they provide to text messaging and social media make it easier than ever for people to disclose personal information and respond to others in their social networks. 6. These networks are much larger and more far-flung than those of our ancestors. 7. “Evolution shaped self-disclosure and responsiveness in the context of small kin networks, and we now see these behaviours being cued more or less constantly by social networking sites and through our phones,” Sbarra said in a statement. 8. He also said that smartphones and their affordances create new contexts for disclosing information about who we are and for being responsive to others, and these virtual connections may have downstream unwanted effects on our current relationships. This smartphone obsession is causing relationships to get sour for obvious reasons. “When you are distracted into or by the device, then your attention is divided, and being responsive to our partners — an essential ingredient for building intimacy — requires attention in the here and now,” he said. Divided attention, researchers said, may lead to relationship conflict. For example, a study of 143 married women, more than 70 percent of whom reported that mobile phones frequently interfere in their relationships.